The results of the Best Western Video Game Music of All Time Poll are in! We've compiled a list of 250 songs from numerous composers that seem to be overlooked by much of the VGM community at large, including tons of stuff from the Commodore 64, Amiga, NES and Genesis, along with numerous indie games (and a few AAA titles even) that stand out from the crowd. If nothing else, it should help get rid of that perception that all Western music is generic Hollywood-type stuff! Updates are going to be slow for a bit due to the holidays and everything, plus other Big Happenings Coming Soon, but in the meantime here's a few shorter articles. Every once in awhile I'm possessed to write about obscure Sega minutae - this time it's Dynamite Dux, which I believe is one of the first cutesy-type beat-em-ups. Overall it's rather average, but it's got a great graphical style, and it's one of those games I'd always read about in magazines for the Sega Master System but had never really played since the system had largely dried up in America when it came out. In other mediocrity news, we also have a review of Blake Stone, two first person shooters from the shareware era that licensed the Wolfenstein 3D engine and took the adventures into space. They also had the bad luck to be released within weeks of Doom and Doom II, respectively, which means they looked and played terribly outdated, but in spite of that I (and probably a few other people out there) have some vaguely pleasant memories of them. A bit away from the usual norm is an extensive review of all seven versions of Last Action Hero. Why, exactly? Well, every one of us has some kind of game that marked our transition from naive kids who loved everything placed in front of us into cynical bastards aware of commercial exploitation. For me, that game was Bubsy. For Audun Sorlie, it was this. We don't have a proper kusoge article ready this week, but this will more than suffice for quite awhile. There's even a short interview with one of the guys involved that helps explain the ridiculousness of what went wrong, despite a solid design document. The only truly great game featured in this update is Skygunner, an incredibly fun early PS2 created by a studio called PixelArts. 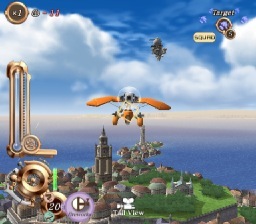 It's a cutesy air combat-type game with irrespresibly cute Japanese-style artwork mixed with a fantastic European-style setting, with some really excellent music. It's light and breezy, and something of a cult classic. Also, thanks to Adventure Gamers for cataloguing my stupid game Que Pasa Perro? in its database, and covering it on their November 2011 Freeware roundup, vaguely legitimizing some random goofiness I threw together over the course of the week. Extra double thanks to the guy who recorded a whole walkthrough and posted it on Youtube. He's doing a Let's Play of the terrifying Bubsy 3D so you know he's an alright kinda guy. And super triple thanks to the folks behind its TVTropes page. I do hope you check out the whole ordeal if you haven't already. Oh baby, a TvTropes page! You're riding high, now. Right on the same echelon as terrible "edgy" Sailor Moon fanfiction and creepy diaper fetish comics drawn by pedophiles (yes, that is actually something TvTropes has a fanpage for). To add to the dynamite dux article, Bean the Dynamite also reappears in Fighters Megamix, aswell as a cameo in Sonic Generations on a 'missing' poster (if i recall, maybe not). Small correction: Dynamite Dux was '89, not '87. Nice article otherwise!